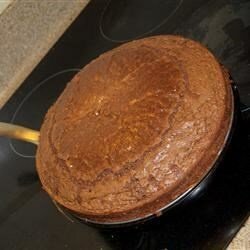 "A dense, moist chocolate cake made from scratch. Can be doubled without any problems." Preheat oven to 350 degrees F (175 degrees C). Grease and flour a 9 inch tube pan. In small saucepan, heat butter, chocolate and water until chocolate melts and mixture is smooth, stirring constantly. Set aside to cool. Sift together into a large bowl the flour, sugar and baking soda. In a small bowl, beat egg slightly and combine with sour cream and vanilla. Stir into flour mixture. Pour in the cooled chocolate mixture. Beat at low speed for 5 minutes until completely combined and the consistency of heavy cream. Pour batter into prepared 9 inch tube pan. Bake in the preheated oven for 45 to 60 minutes, or until a toothpick inserted into the center of the cake comes out clean. Let cool in pan for 10 minutes, then turn out onto a wire rack and cool completely. Very easy to make. I ommitted the sour cream and only put in 1 cup of sugar as I couldn't get bitter chocolate only the normal dark kind, but it rose beautifully and tasted great. Extremely moist! Sour cream always makes cakes moist. I used semi-sweet chocolate and the cake turned out perfect. No icing necessary.